Black is checkmated - the game is over. Checkmate (often shortened to mate) is a game position in chess (and in other board games of the chaturanga family) in which a player's king is in check (threatened with capture) and there is no way to remove the threat. Checkmating the opponent wins the game. In chess the king is never actually captured - the game ends as soon as the king is checkmated. In master and serious amateur play, most players resign an inevitably lost game before being checkmated, and it is considered bad etiquette to continue playing in a completely hopeless position. If a player is not in check but has no legal move, then it is stalemate, and the game immediately ends in a draw. A checkmating move is recorded in algebraic notation using the hash symbol (#) - for example, 34.Qh8#. A checkmate may occur in as few as two moves with all of the pieces still on the board (as in Fool's mate, in the opening phase of the game), in a middlegame position (as in the 1956 game called the Game of the Century between Donald Byrne and Bobby Fischer), or after many moves with as few as three pieces in an endgame position. The term checkmate is, according to the Barnhart Etymological Dictionary, an alteration of the Persian phrase "shāh māt" (شاه مات) which means, literally, "the King is helpless". Others maintain that it means "the King is dead", as chess reached Europe via the Islamic world, and Arabic māta (مَاتَ) means "died" or "is dead". However, in the Pashto language (an Iranian language), the word māt (مات) still exists, meaning "destroyed, broken". Moghadam traced the etymology of the word mate. It comes from a Persian verb mandan (ماندن), meaning "to remain", which is cognate with the Latin word maneō and the Greek menō (μενω, which means "I remain"). It means "remained" in the sense of "abandoned" and the formal translation is "surprised", in the military sense of "ambushed". "Shāh" (شاه) is the Persian word for the monarch. Players would announce "Shāh" when the king was in check. "Māt" (مات) is a Persian adjective for "at a loss", "helpless", or "defeated". So the king is in mate when he is ambushed, at a loss, helpless, defeated, or abandoned to his fate. In modern parlance, the term checkmate is a metaphor for an irrefutable and strategic victory. In early Sanskrit chess (c. 500-700) the king could be captured and this ended the game. The Persians (c. 700-800) introduced the idea of warning that the king was under attack (announcing check in modern terminology). This was done to avoid the early and accidental end of a game. Later the Persians added the additional rule that a king could not be moved into check or left in check. As a result, the king could not be captured, and checkmate was the only decisive way of ending a game. Before about 1600, the game could also be won by capturing all of the opponent's pieces, leaving just a bare king. This style of play is now called annihilation or robado. In Medieval times players began to consider it nobler to win by checkmate, so annihilation became a half-win for a while, until it was abandoned. Two major pieces (queens or rooks) can easily force checkmate on the edge of the board. The process is to put the two pieces on adjacent ranks or files and gradually force the king to the side of the board, where one piece keeps the king on the edge of the board while the other delivers checkmate. In the illustration, white checkmates by forcing the black king to the edge, one row at a time. The same process can also be used to checkmate with two rooks, or with two queens. There are four fundamental checkmates when one side has only his king and the other side has only the minimum material needed to force checkmate, i.e. (1) one queen, (2) one rook, (3) two bishops on opposite-colored squares, or (4) a bishop and a knight. The king must help in accomplishing all of these checkmates. If the superior side has more material, checkmates are easier. The checkmate with the queen is the most common, and easiest to achieve. It often occurs after a pawn has queened. A checkmate with the rook is also common, but a checkmate with the two bishops or with a bishop and knight only occur relatively infrequently. The two bishop checkmate is fairly easy to accomplish, but the bishop and knight checkmate is difficult and requires precision. The first two diagrams show representatives of the basic checkmate positions with a queen, which can occur on any edge of the board. Naturally, the exact position can vary from the diagram. In the first of the checkmate positions, the queen is directly in front of the opposing king and the white king is protecting its queen. In the second checkmate position, the kings are in opposition and the queen mates on the rank (or file) of the king. White checkmates easily in this position. With the side with the queen to move, checkmate can be forced in at most ten moves from any starting position, with optimal play by both sides, but usually fewer moves are required. In positions in which a pawn has just promoted to a queen, at most nine moves are required. 1. Qf6 Kd5 2. Qe7 Kd4 3. Kc2 Kd5 4. Kc3 Kc6 5. Kc4 Kb6 6. Qd7 Ka6 7. Qb5+ Ka7 8. Kc5 Ka8 9. Kc6 Ka7 10. Qb7#. Stalemate if Black is to move. The white queen blocks off all possible moves for black, regardless of where the white king is placed on the board. This is a stalemate if Black is to move. The superior side must be careful to not stalemate the opposing king, whereas the defender would like to get into such a position. There are two general types of stalemate positions that can occur, which the stronger side must avoid. White checkmates by boxing in the black king. The first diagram shows the basic checkmate position with a rook, which can occur on any edge of the board. The black king can be on any square on the edge of the board, the white king is in opposition to it, and the rook can check from any square on the rank or file (assuming that it can not be captured). The second diagram shows a slightly different position where the kings are not in opposition but the defending king must be in a corner. With the side with the rook to move, checkmate can be forced in at most sixteen moves from any starting position. Again, see Wikibooks - Chess/The Endgame for a demonstration of how the king and rook versus king mate is achieved. 1. Kd3+ Kd5 2. Re4 Kd6 3. Kc4! Kc6 4. Re6+ Kc7 5. Kc5 Kd7 6. Kd5 Kc7 7. Rd6 Kb7 8. Rc6 Ka7 9. Kc5 Kb7 10. Kb5 Ka7 11. Rb6 Ka8 12. Kc6 Ka7 13. Kc7 Ka8 14. Ra6# (second checkmate position, rotated). This is stalemate if Black is to move. The white king can also be on c7 or b6. This is stalemate if Black is to move. Here are the two basic checkmate positions with two bishops (on opposite-colored squares), which can occur in any corner. (Two or more bishops on the same color, which could occur because of pawn underpromotion, cannot checkmate.) The first is a checkmate in the corner. The second position is a checkmate in a side square next to the corner square. With the side with the bishops to move, checkmate can be forced in at most nineteen moves. If the side with the bishops is to move, they can force checkmate except in some very rare positions. The bishops are best when they are near the center of the board and on adjacent diagonals. This cuts off the opposing king. The king must be used aggressively, in conjunction with the bishops. Two bishops (and king) can force checkmate (from Seirawan). 1. Ke2 Ke4 (Black tries to keep his king near the center) 2. Be3 Ke5 (forcing the king back, which is done often) 3. Kd3 Kd5 4. Bd4 Ke6 5. Ke4 Kd6 (Black tries a different approach to stay near the center) 6. Bc4 (White has a fine position; the bishops are centralized and the king is active) 6... Kc6 (Black avoids going toward the side) 7. Ke5 Kd7 (Black is trying to avoid the a8-corner) 8. Bd5 (keeping the black king off c6) 8... Kc7 9. Bc5 Kd7 10. Bd6! (an important move that forces the king to the edge of the board) 10... Ke8 (Black is still avoiding the corner) 11. Ke6 (now the black king cannot get off the edge of the board) 11... Kd8 12. Bc6 (forcing the king toward the corner) 12... Kc8 (Black's king is confined to c8 and d8; the white king must cover a7 and b7) 13. Kd5 (13. Ke7? is stalemate) 13... Kd8 14. Kc5 Kc8 15. Kb6 Kd8 (now White must allow the king to move into the corner) 16. Bc5 Kc8 17. Be7! (an important move that forces the king toward the corner) 17... Kb8 18. Bd7! (the same principle as the previous move) 18... Ka8 19. Bd8 (White must make a move that gives up a tempo; this move is such a move, along with Bc5, Bf8, Be6, or Ka6) 19... Kb8 20. Bc7+ Ka8 21. Bc6# (as the first diagram in this section). Note that this is not the shortest forced checkmate from this position. Müller and Lamprecht give a fifteen-move solution, however it contains an inaccurate move by Black (according to endgame tablebases). 1. Kb6 would be stalemate (from Silman). One example of a stalemate is this position, where 1. Kb6 (marked with the x) would be stalemate. Of the basic checkmates, this is the most difficult one to force, because these two pieces cannot form a linear barrier to the enemy king from a distance. Also, the checkmate can be forced only in a corner that the bishop controls. This is a second checkmate with a bishop and knight. Two basic checkmate positions are shown with a bishop and a knight, or the bishop and knight checkmate. The first position is a checkmate by the bishop, with the black king in the corner. The bishop can be on other squares along the diagonal, the white king and knight have to be on squares that attack g8 and h7. The second position is a checkmate by the knight, with the black king on a side square next to the corner. The knight can be on other squares that check the black king. The white king must be on a square to protect the bishop and cover a square not covered by the knight. With the side with the bishop and knight to move, checkmate can be forced in at most thirty-three moves from any starting position, except those in which the defending king is initially forking the bishop and knight and it is not possible to defend both. However, the mating process requires accurate play, since a few errors could result in a draw either by the fifty-move rule or stalemate. ... mastering it would take a significant chunk of time. Should the chess hopeful really spend many of his precious hours he's put aside for chess study learning an endgame he will achieve (at most) only once or twice in his lifetime? After 1.Na3+, 1...Kc1 draws because of stalemate if the bishop moves. This position is an example of a stalemate, from the end of a 1966 endgame study by A. H. Branton. White has just moved 1.Na3+. If Black moves 1...Kc1 then White must move his bishop to save it because if the bishop is captured, the position is a draw because of the insufficient material rule. But after any bishop move, the position is a stalemate. A back-rank checkmate is a checkmate delivered by a rook or queen along a back rank (that is, the row on which the pieces [not pawns] stand at the start of the game) in which the mated king is unable to move up the board because the king is blocked by friendly pieces (usually pawns) on the second rank. An example of a back-rank checkmate is shown in one of the diagrams. It is also known as the corridor mate. Scholar's Mate - Black is checkmated. The moves might be played in a different order or in slight variation, but the basic idea is the same: the queen and bishop combine in a simple mating attack on f7 (or f2 if Black is performing the mate). There are also other ways to checkmate in four moves. Fool's Mate - White is checkmated. A smothered mate is a checkmate delivered by a knight in which the mated king is unable to move because he is surrounded (or smothered) by his own pieces. 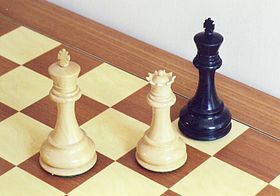 The mate is usually seen in a corner of the board, since fewer pieces are needed to surround the king there. The most common form of smothered mate is seen in the diagram to the right. The knight on f7 delivers mate to the king on h8 which is prevented from escaping the check by the rook on g8 and the pawns on g7 and h7. Similarly, White can be mated with the white king on h1 and the knight on f2. Analogous mates on a1 and a8 are rarer, because kingside castling is the more common as it safely places the king closer to the corner than it would had the castling occurred on the queenside. In some rare positions it is possible to force checkmate with a king and knight versus a king and pawn. White wins by Stamma's mate, with either side to move. Reaching the position in the first diagram, with Black to move. A similar position with the Knight on d2 is more than 500 years old, identified as "Partito n. 23" by Luca Pacioli, in his MS De ludo scachorum (Latin for The game of chess), dated 1498 and recently reprinted (Gli scacchi) by Aboca Museum Edizioni. 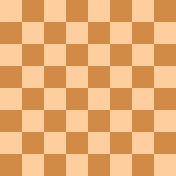 There are also positions in which a king and a knight can checkmate a king and a bishop, knight, or rook; or a king and a bishop can checkmate a king with a bishop on the other color of squares or with a knight, but the checkmate cannot be forced if there is no other material on the board (see the diagrams for some examples). Nevertheless, it keeps these material combinations from being ruled a draw because of "insufficient mating material" or "impossibility of checkmate" under the FIDE rules of chess. The U.S. Chess Federation rules are different. In a typical position with a minor piece versus a minor piece, a player would be able to claim a draw if he has a limited amount of time left. Checkmate positions are possible to construct, but they cannot be forced. Checkmate cannot be forced. Here, ...Ka8? allows checkmate (Nbc7#), but ...Kc8! avoids it. It is impossible to force checkmate with a king and two knights, although checkmate positions are possible (see the first diagram). In the second diagram, if Black plays 1... Ka8? White can checkmate with 2. Nbc7#, but Black can play 1... Kc8 and escape the threat. The defender's task is easy - he simply has to avoid moving into a position in which he can be checkmated on the next move, and he always has another move available in such situations. In the third diagram, one knight is guarding c1, leaving the other knight to try to checkmate. After 1.Ndc3+ Ka1, White needs to get the knight on e2 to c2. But if White plays 2.Nd4, Black is stalemated. Three knights and a king can force checkmate against a lone king within twenty moves (assuming that the lone king cannot quickly win a knight). These situations are generally only seen in chess problems, since at least one of the knights must be a promoted piece, and there is very rarely a reason (e.g., avoidance of stalemate) to promote a pawn to anything other than a queen (see underpromotion).